The New York Giants have been meeting with all of the top quarterback prospects leading up to this month’s NFL Draft. The Giants are attempting to find the successor to franchise legend Eli Manning. Manning is 38 years old and will be retiring sooner than later. In order for the Giants to be prepared for Manning’s retirement, they need to find his successor before he goes. The Giants have been evaluating all of their options. They have looked into a possible trade for Josh Rosen. But now, there are rumors that the Giants might be able to get a much better quarterback via trade. That quarterback is Russell Wilson. Seattle Seahawks quarterback Russell Wilson has had his name come up in trade rumors recently. These rumors began in February when Fox Sports show host Colin Cowherd revealed discussions he heard in the “agency world.” Cowherd claimed that Wilson wanted to play for the New York Giants because of the city’s market. 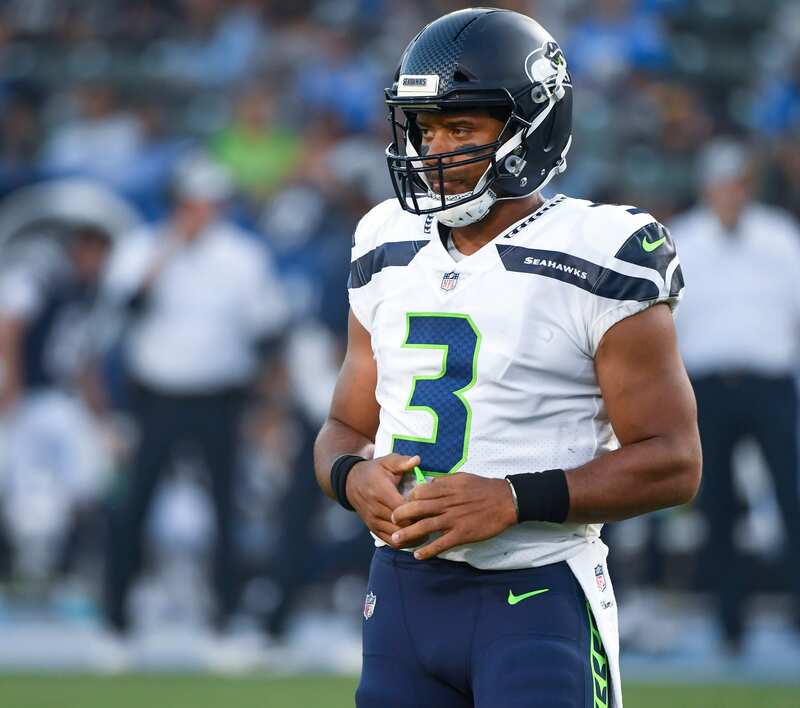 This rumor began to heat up a bit when Russell Wilson gave the Seahawks an ultimatum regarding his upcoming contract extension. Wilson told the Seahawks to give him an extension by April 15th, however, the two sides were unable to come close to a deal. On April 14th, rumors began swirling all over the place regarding Wilson’s future in Seattle. According to Rotoworld Football, the Seahawks think Russ wants to play ‘elsewhere’. If that is true, then it is very possible that Cowherd’s rumors regarding Wilson’s desire to play in New York are true, too. Even Tyrann Mathieu believes Wilson wants to play in New York. What Would This Trade Cost? The Giants are one of two NFL teams that hold multiple 1st-round picks in the 2019 NFL Draft. The Giants have two 1st-round picks and the Oakland Raiders have three 1st-round picks. The Giants could start their trade offer to the Seahawks with the 6th overall pick and the 17th overall pick. They would, of course, need to add even more, but the Giants have the resources necessary to complete this trade. Since the Seahawks will want a player, too, the Giants could look to free up cap space by trading away players such as Janoris Jenkins and Alec Ogletree. Both of these players have high cap hits and do not necessarily live up to their contracts, but they would be solid additions for the Seahawks. If the Giants do complete a trade for Wilson, it is going to cost them a lot of salary cap space. Wilson wants a contract extension that could potentially make him the highest-paid player in NFL History. Highest paid QB EVER? Russell Wilson (@DangeRussWilson) acknowledges the possibility, says he could play "10-15 more years" in Jimmy Fallon interview. Unfortunately, the Giants do not currently have that cap space. The Giants only have $11,783,442 in cap. But, by trading away one of their high-paid veterans, the Giants could make that number grow. The Giants could also free up cap space by cutting quarterback Eli Manning. With Russell Wilson on the roster, Manning’s services would no longer be needed. The Giants could free up $12,000,000 by cutting Eli Manning. The Giants will need to free up as much space as possible. Reports indicate that Wilson’s contract could surpass $35,000,000 per year. Despite the high price, the Giants should strongly consider trading for Russell Wilson. Trading for Wilson would completely change the trajectory of the franchise. You never know what you are getting when you draft a rookie quarterback. You know what you are getting when you trade for Russell Wilson. When you trade for Russell Wilson, you are getting a top-5 quarterback in the NFL. Wilson has thrown for over 30 touchdown passes 3 times in his career, including a career-best 35 in 2018. He is one of the most productive passers in the league. And @TDLockett12 is WIDE open! Wilson is also an extremely efficient quarterback. In 2018, Russell only threw 7 interceptions. Wilson has thrown less than 10 interceptions in 4 of his 7 career seasons. Wilson’s career high for interceptions in a season is only 11. He has done this while being sacked over 40 times in 6 of his 7 seasons. Russell Wilson is also one of the NFL’s best dual-threat quarterbacks. He is an extremely efficient and productive passer, but as a runner, it is more of the same. Wilson has 3,651 career rushing yards and 16 career rushing touchdowns. He averages 521 rushing yards per season. The RPO game would be unstoppable with Russell Wilson and Saquon Barkley. He can throw, he can run, and @DangeRussWilson can stretch too! Most importantly, Wilson is a winning quarterback. Russell has never played on an NFL team with a record below .500. Every year, the Seattle Seahawks are playoff contenders because of Russell Wilson. He is an electrifying signal-caller who makes his team better on every play. Wilson has an 8-5 playoff record and is also the Super Bowl 48 Champion (2014). Russell Wilson would instantly make the Giants a playoff team and a Super Bowl contender.